A rarely seen bolete, which status is still much debated. Its specific status has been advocated by Brillouet & Brillouet (1993), Simonini (1998), Estadès & Deïana (2004) and Watling & Hills (2005). 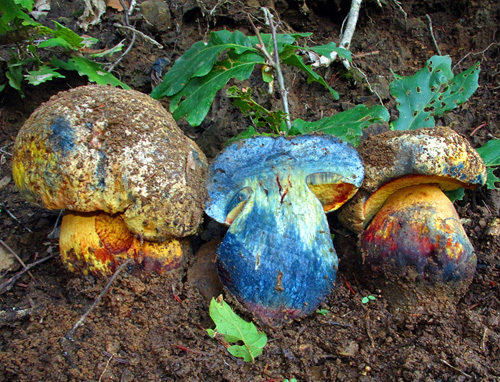 However, Muñoz (2005) includes remarks suggesting that he thinks of it as possible xanthoid form of Boletus torosus. Further research, including by molecular techniques will probably help to solve this problem. At this point the author is unable to take any side as this bolete is known to him only from the literature. 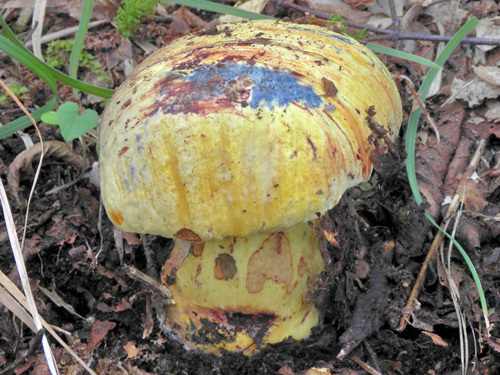 Boletus xanthocyaneus is a bolete with stout fruitbodies with dense and heavy flesh, similarly to B. torosus. It is distinguished by entirely striking yellow fruitbodies, which turn blue-black at the slightest touch. The bright yellow cap remains so for a long time and sometimes with age may develop reddish, pinkish or violaceous-brownish hues. In B. torosus it is thought that greyish and olive tints prevail on the cap. 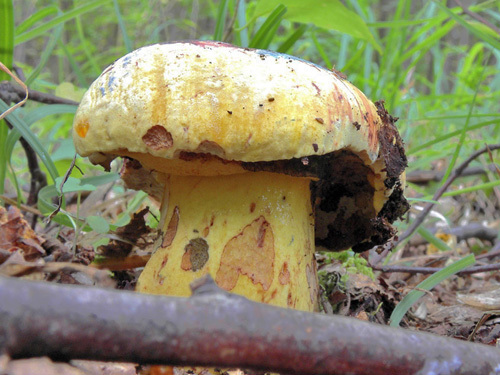 It is also said that this bolete has agreeable fruity smell, opposed to the unpleasant smell of B. torosus. 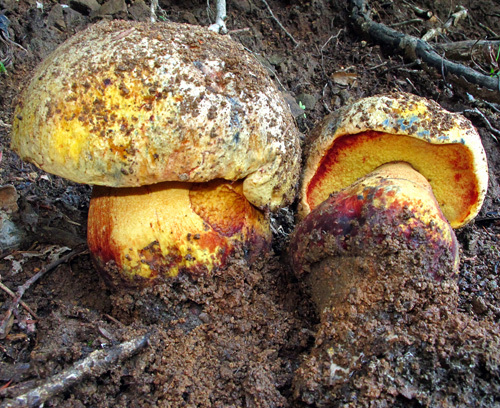 The distinction from the yellow forms of Boletus rhodopurpureus seems rather uncertain, especially in young fruitbodies, as these may sometimes lack the typical reddish-orange or red coloured pores. Compare also to Boletus poikilochromus. Habitat. Warm broadleaf forests, usually (if not always) on neutral or acid soils, mycorrhizal with broadleaf trees, most probably Quercus. Distribution. Seen rarely and collections are known from France, Greece, Italy, Spain and the United Kingdom. Alessio, C.L. 1998. Boletus & Inocybe. – In: Fungi non delineati. Vol. 3. Pp. 1–40 + Pl. 1–8. Libreria Mykoflora, Alassio.